JOANNA'S RULES: 1. If it takes longer to cook it than eat it, forget it. 2. If I can't find the ingredients in my local supermarket, then the recipe doesn't go in the book. 3. Every recipe has to be low in fat and sugar, and high in taste appeal. 4. Healthy Exchanges food has to satisfy the hungry appetite of my truck-drivin' husband, Cliff. Who can forget the down-home goodness of Grandma's cooking? Tastes and smells that fill the kitchen. Rich, hearty foods that excite the appetite. All-time favorites that warm the heart...JoAnna Lund remembers. And now she recaptures those special moments by offering 120 old-fashioned recipes-for a new generation. Here are your most beloved comfort foods without the extra fat, calories, or guilt. Savory soups and salads, scrumptious main dishes, sinfully good desserts - they're all here, brilliantly reworked for today's health-conscious home. You won't believe how good they taste. And you won't believe how good they are for you. Of course, every Healthy Exchanges recipe is quick and easy to prepare, with ingredients you can find at any grocery store. 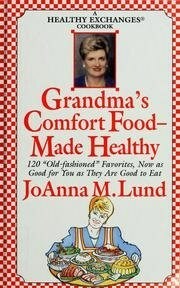 JoAnna Lund knows there's nothing quite like a wholesome, home-cooked meal-the old-fashioned way. Now, believe it or not, she's made it healthy, too!